This article is about the American musician. For the American military officer and consultant, see John Batiste. 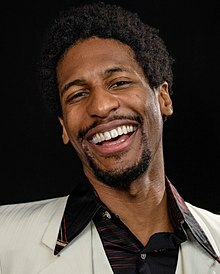 Jon Batiste was born in Kenner, Louisiana, into a long line of musicians, including Lionel Batiste and Harold Battiste. At the age of 8, he played percussion and drums with his family's band, the Batiste Brothers Band. At his mother's suggestion, he switched to piano at the age of 11. Jon developed his piano skills by taking classical music lessons and transcribing songs from video games such as Street Fighter Alpha, Final Fantasy VII and Sonic the Hedgehog. At 17, Batiste released Times in New Orleans. He attended the New Orleans Center for Creative Arts with Trombone Shorty and St. Augustine High School, New Orleans, Louisiana, and graduated in 2004 before going on to receive a bachelor's and master's degree from the Juilliard School. While at Juilliard, he released his second album Live in New York: At the Rubin Museum of Art, and by the end of 2006, had been a featured performer in South Africa, London, Lisbon, Spain, Paris and the United States. In 2007, Batiste made his debut at the Concertgebouw in Amsterdam at the age of 20, both producing and performing his own show. He conducted music clinics, classes and workshops throughout the Netherlands in inner-city schools and underprivileged neighborhoods. He was invited back to Carnegie Hall to produce and perform in his own show including six young musicians from the country. The performance concluded with a finale he composed for choir, jazz combo and orchestral instruments. In the year following, Batiste released a number of music projects including Social Music (2013) which spent over a month at the top of the Billboard and iTunes jazz charts, "The Late Show EP" (2016) with Stay Human and a holiday album "Christmas with Jon Batiste" (2016). In 2017, he released the singles "Ohio" with Leon Bridges and Gary Clark Jr. as well as "Battle Hymn of the Republic" for The Atlantic. Batiste's debut solo album Hollywood Africans was released under Verve Records in September 2018. "Don't Stop" served as the lead single. Batiste's cover of "St. James Infirmary Blues" was nominated for a Grammy in 2019, in the category of Best American Roots Performance. Leading up to the album release, Batiste completed a Summer Festival tour across the U.S. with The Dap-Kings. Batiste's notable career performances include a tribute to Chuck Berry and Fats Domino during the 60th annual Grammy Awards (performing alongside Gary Clark Jr.), the Kennedy Center Honors in tribute to Carmen De Lavallade, the Concert for Peace and Justice in Montgomery, Alabama as well as the National Anthem at the 2017 NBA All Star Game and Opening Night of the 2017 US Open. He has curated the Global Citizen Advocacy Concert with Tom Morello and the Louis Armstrong Wonderful World Festival in Queens, N.Y.
Batiste is currently signed with Mick Management. In 2005, Batiste began performing regularly in New York with his Juilliard peers, bassist Phil Kuehn and drummer Joe Saylor. He later added Eddie Barbash on alto saxophone and Ibanda Ruhumbika on tuba. Batiste named the band Stay Human, which draws its moniker from the belief that human interaction during a live musical performance can uplift humanity in the midst of the "plug in/tune out" nature of modern society. The band leads impromptu street performances, which Batiste calls "love riots." In 2011, Stay Human released the album MY N.Y., which was recorded in its entirety on New York City Subway trains, an idea that came to Batiste after questioning how to connect with people. On April 22, 2017, the band played for the March for Science rally at the Washington Monument in Washington, D.C. In 2014, Batiste and Stay Human appeared on The Colbert Report to perform the group's single, "Express Yourself", written and produced with Austin Bis. On June 4, 2015, it was announced that the group would serve as house band on The Late Show with Stephen Colbert. The show premiered on CBS on September 8, 2015. On the show, Batiste and Stay Human have performed alongside Billy Joel, Will Smith, Wynton Marsalis, John Legend, Grace Vanderwaal, and Nas. Batiste was cast in the HBO television series Treme, appearing in seasons 2, 3 and 4. He was also cast as T.K. Hazelton in director Spike Lee's film Red Hook Summer and composed and performed the Hammond B-3 organ music that was a part of the film score. Other film scores composed by Batiste include the television documentary Duke 91 & 92: Back to Back and the short film Melody of Choice. He also appears in the film Thrive by Paul Szynol. Batiste was included in the 2016 Forbes 30 Under 30 music list and was named Grand Marshal of Endymion Parade in New Orleans in 2018. He has been awarded the American Jazz Museum Lifetime Achievement Award, the Harry Chapin ASCAP Humanitarian Award and the Movado Future Legend Award. In May 2017, Batiste received an honorary degree from Salve Regina University for his musical achievements and contributions to Newport's 2014 International Jazz Day. Batiste has been featured in campaigns for Chase Bank, Apple Watch, Lincoln Continental, and numerous fashion brands including Ralph Lauren, Barneys, Nordstrom, Frye Boots and Bonobos. ^ Hollywood Africans reached number 33 on Billboard's United States Top Current Albums chart, not the regular Billboard 200 that also includes catalog albums in addition to current records. ^ Pogrebin, Robin (2012-06-17). "National Jazz Museum in Harlem Plans Expansion". The New York Times. ^ Serico, Chris (4 June 2015). "'I like this guy': Stephen Colbert chooses Jon Batiste as 'Late Show' bandleader". Today. Retrieved 25 July 2018. ^ Ehrlich, Dimitri (November 11, 2013). "Jon Batiste". Interview Magazine. ^ Weingarten, Christopher (August 5, 2015). "Meet Jon Batiste, Colbert's Crowd-Thrilling Bandleader". Rolling Stone. ^ "Award-Winning Jazz Artist Batiste Performs at SU Monday, September 24". Salisbury University. 12 September 2012. Retrieved 7 October 2015. ^ Hodges, Bruce (November 2014). "3 Releases From Jazz Grads". The Juilliard Journal. Retrieved 6 October 2015. ^ "#LoveRiot: A Classic "Had To Be There" NYC Moment". Joonbug.com. 2012-04-11. Retrieved 2012-09-18. ^ Blumenfeld, Larry (4 January 2012). "Jonathan Batiste and the Stay Human Band Fill the Subway with Their Take on Jazz". ^ Resnick, Brian (April 22, 2017). "The March for Science on Earth Day, explained". Vox. Retrieved February 6, 2019. ^ Whyte, Chelsea; Grossman, Lisa (April 22, 2017). "On the ground in Washington at the March for Science". New Scientist. Retrieved February 6, 2019. ^ "Stephen Colbert's new Late Show band leader gave one of The Colbert Report's best performances". The Verge. Retrieved 8 June 2015. ^ "Meet Jon Batiste, Bandleader for The Late Show with Stephen Colbert". Time. Retrieved 8 June 2015. ^ "Jon Batiste, 29". Forbes. Retrieved 25 July 2018. ^ "George Wein, Jon Batiste to Receive Honorary Degrees from Salve Regina; Batiste to Give Commencement Address". What'sUpNewp. 2017-04-12. Retrieved 2017-05-23. ^ "Jon Batiste Chart History (Billboard 200)". Billboard). Retrieved November 2, 2018. ^ a b c "Jon Batiste Chart History (Heatseekers Albums)". Billboard. Retrieved November 2, 2018. ^ a b c d "Jon Batiste Chart History (Jazz Albums)". Billboard. Retrieved November 2, 2018. ^ "Top 200 Albums". Billboard. January 7, 2017. Retrieved November 2, 2018. ^ "Heatseekers Albums". Billboard. January 7, 2017. Retrieved November 2, 2018. ^ "Holiday Albums". Billboard. January 7, 2017. Retrieved November 2, 2018. ^ "Independent Albums". Billboard. January 7, 2017. Retrieved November 2, 2018. ^ "Jazz Music: Top Jazz Albums". Billboard. January 7, 2017. Retrieved November 2, 2018. "A Conversation with Jon Batiste". Aspen Ideas Festival. Retrieved 2015-06-07. Martel, Brett (2008-02-18). "New Orleans tourism gets boost from NBA All-Star game". USA Today. Retrieved 2008-04-07. Kozinn, Allan (January 23, 2008). "Mystical to Muscular: Many Styles in Play at a Keyboard Marathon". The New York Times. Retrieved 2008-04-07. Pogrebin, Robin (March 26, 2008). "Louisiana Extols Culture in Recovery". The New York Times. Retrieved 2008-04-13. Wikimedia Commons has media related to Jon Batiste. This page was last edited on 1 April 2019, at 14:13 (UTC).